Didn’t I throw those clippings away? What crazy science made them turn pink and sprout?! Also, ewwwww!! Upon closer inspection, I realized that they were…honeysuckle stamens. Phew! Call off the haz-mat team (for today, at least). Said to me, while playing in the dirt pit: If you said that, I would be 99 frustrated, and bang you to heaven, I think. Said to no one in particular at dinner: We’re just freakin’ out at the table with our soup next to us. Betsy: hmm, what is that tool called? B: what is that tool called? B: now what is that tool called? When I told him that he’ll get one of Grandma’s molasses cookies at her house: Me not like the flavor of molasses cookies. Me DO like the flavor of chocolate cookies. While having a conversation about his newest interests, blood and bones, we were talking about things in nature that do or don’t have blood: Is there blood in our drinks? Apropos of nothing: Cookie Monster will tear you apart. Chairman requests meeting, “LIKE DADA WORK!”, in the bathtub. Vice-Chairman calls the meeting to order. Vice-Chairman: Looks like wiggleworm is splashing in the bathtub. Vice-Chairman: Why are you a wiggleworm? Meeting Recess called to allow Vice-Chairman to scrub the Chairman. Chairman introduces new board member, “MAMA!” Mama appears to be a crumpled-up washcloth stuffed in a plastic cup. Mama proceeds to pee on Chairman’s leg, Chairman’s hand, and on Vice-Chairman’s head. Vice-chairman submits his report on the Bathwater to (non-pretend) Urine ratio. The Chairman has successfully met the organization’s goals of a 0% urine concentration in the bathwater. The board elects to award the Chairman with a performance bonus, payable in the form of allowing him to drink the shower water. The board takes a shower to rinse off, and the Chairman collects his bonus vigorously. The shower ends, and the board dries themselves. Vice-Chairman: I don’t know, what? The Chairman is dressed in pajamas and teeth are brushed. The meeting is adjourned to allow for the reading of books and serving of bedtime snack. Betsy: Man, I can’t get this Justin Bieber song out of my head! …It’s probably my own fault, though, since I listened to it 3 times in a row today. Betsy: C’mon! It’s a good song! Seth: Mama! No sing! Yucky! Seth: Me like “Old McDonald” song. Seth and Todd dancing around in the living room, with Seth laughing hysterically the whole time. I’m working on putting together another video, but this one needed to be stand-alone, unedited. Pure joy! Seth and Dad dancing from Eel Fang on Vimeo. I posted this on Facebook the other day, but the video was set to Private – if you tried (and failed) to watch it there, try again now. Todd: Close – the cover to Sonic Youth’s “Goo” album is the black & white illustration by Raymond Pettibon. 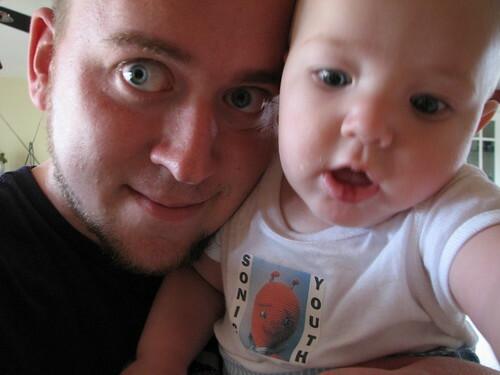 Your shirt has the cover art from Sonic Youth’s album “Dirty”. Pretty good guess, though. Todd: That’s right! Dad is wearing his t-shirt from the psychedelic Japanese band OOIOO. It’s usually pronounced “oh-oh-eye-oh-oh”, not as one long vowel sound like you made, but even adults make that mistake all the time. Todd: I’m sorry, what did you just say?! No son of mine is going to listen to 70′s Swedish disco bands. You go straight to your room, young man! the eelfang chronicles is powered by	WordPress 3.6 and delivered to you in 0.309 seconds using 39 queries.